The boom in the Great Indian Smartphone Bazaar continues unabated, with quite a few new brands vying for your money. Incumbents are using new strategies to lure buyers. Xiaomi for example, now has a new sub-brand with the killer POCO F1 in the offing, a smartphone that obliterates rivals purely on specs and pricing. Realme, which was born as OPPO’s sub-brand but eventually branched out as a separate brand, also has some interesting, VFM offerings. Korean major Samsung is bringing flagship features to the mid-range and now has mid-tier options with three, even four rear cameras. Lenovo has just made a comeback into the Indian smartphone market, while new brands like iTel, Tambo, Infinix etc are making things even more confusing for buyers. Amidst this cacophony are the millions of smartphone users in India, with many of them now looking to upgrade. The entire study is embedded below, but if you are crunched on time, then read on ahead for the highlights. 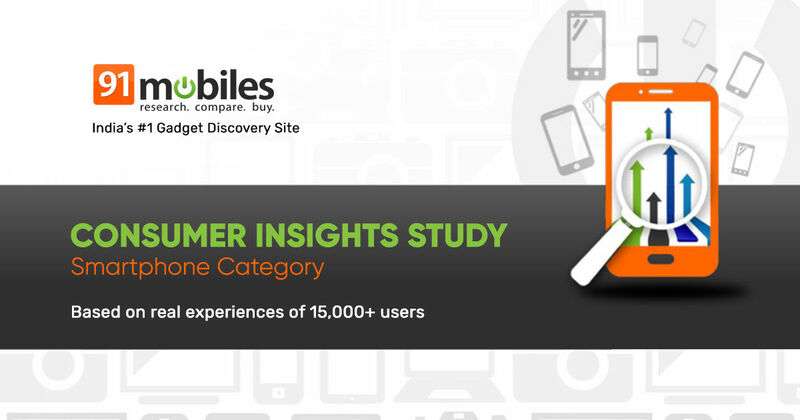 To understand how satisfied users are with their current smartphone, whether they’ll recommend the same brands to others or not, and the issues they face with their daily drivers on a regular basis, we at 91mobiles conducted a large-scale online survey. And thanks to over 15,000 smartphone users who responded to the survey, we were able to analyse the data and come up with the answers we were looking for. Before we get to the specifics though, let’s set the context. Note that the findings of this survey are representative of the 15,000+ entries we received. By analysing the responses to questions on the smartphone brands the survey respondents owned earlier, the ones they use currently, and the ones they’d like to buy next, we were able to come up with quite a few interesting insights. Samsung used to be the clear market leader earlier, with over 25 percent respondents saying they owned one of the Chaebol’s offerings. Xiaomi stood second with 20 percent. However, things have now gone Xiaomi’s way, with 28 percent users reporting they use a Xiaomi phone. Samsung has dropped to second place, with 19 percent share. In terms of future ownership patterns, over 19 percent respondents are likely to buy a Xiaomi smartphone, and adding the 9 percent who want to buy a POCO-branded smartphone, Xiaomi could continue to lead the market in the months to come too. Samsung share in the future could drop further, and the brand seems to be showing a steady decline with 16 percent survey respondents saying they’ll buy an offering from the Korean manufacturer next. Apple’s share seems to have dropped when we compare the previous and current ownership patterns, but things are looking bright as far as the future is concerned. Its share could go up from the current 2 percent to 6 percent, if our survey data can be taken as representative of the market sentiment. Nokia seems to be following a similar pattern as Apple, and we think that the HMD Global-owned brand’s recent launches would be the main reason why it could be looking at growing numbers in the future – going up from the current 3 percent to about 7 percent. OnePlus is showing a significant bump in numbers in pure percentage terms, moving from 5 percent current share to 15 percent in the future.,It looks like its strategy is paying off, with users of other brands like Honor, OPPO and Samsung wanting to buy a OnePlus phone. Honor and Huawei look more or less stable, but most other brands like Motorola, OPPO, Vivo, Lenovo, ASUS and LG are showing a decline. Worth mentioning again that a large chunk of these users are now looking to migrate to OnePlus. Based on the data which we received in response to the question whether the respondents would recommend their current smartphone brand to others, it was OnePlus that emerged as a clear leader yet again. 90 percent of current OnePlus owners say they’ll recommend the same brand to others, followed by Xiaomi (83 percent), Huawei (82.5 percent), Honor (82.1 percent) and Apple (80.9 percent). Motorola doesn’t fare well here, with 60.9 percent of its users saying they’d recommend the brand to others. It’s Lenovo that sits at the bottom of the list though, with just 49 percent of its user giving it the thumbs up in terms of recommending to others. We asked respondents how they’d rate their current smartphone on value for money, on a scale of 1 to 5, with 5 being the highest. As it turned out, OnePlus scored the highest, with over 90 percent users rating its smartphones 4 or higher. Xiaomi and Honor score high too, with over 76 percent respondents rating these brands 4 or more. The brands that didn’t do well here include LG, Samsung, Motorola, Vivo and Lenovo. Samsung sits closer to the bottom of the list, with 61 percent users saying they’d rate their phones 4 or higher. Another interesting highlight that comes out from our data analysis is the fact that 22 percent of first-time smartphone users are using a Xiaomi device. This is understandable, since Xiaomi’s lot of smartphones, especially those from the affordable Redmi series, clearly offer a lot in terms of value for money. With a share of 14 percent and 12 percent respectively, Lenovo and Samsung were also pretty popular with first-time users. However, do note that Lenovo was missing in action from the Indian smartphone space, and has just made a comeback. Given that over half of the survey respondents have owned their phones for over a year, this data pertaining to Lenovo isn’t really very relevant now. Let’s take a look at some of the most common issues users faced, based on analysis of the survey data. Looking at the responses to the question of whether the users had to take their phones in for service ever, the number of people who replied in the affirmative is 23 percent. Worth mentioning that this is a reasonably large figure, and comes across as quite surprising. Just 12.6 percent Honor users had to visit a service centre. Even OnePlus scored well here, as just 15.5 percent of its users had to make the trip. Note that these figures are much lower than the average of 23 percent we mentioned above. The same figures for most other key brands, including ASUS, LG, Xiaomi, Nokia, Apple and Samsung hover around the average mark. However, Lenovo users seemed to have faced a tough time, with a whopping 33 percent saying they had to take their devices in for service at least once. In general, battery-related concerns seem to be widespread, with a quarter of all respondents facing problems. Slowdowns and performance-related issues are pretty common too, with 20 percent users reporting these. Talking about battery reliability first, it’s OnePlus that fares the best, with just a little over 13 percent users reporting problems. Lenovo and Apple fare the worst here, with almost 40 percent users reporting issues. Moving to camera-related concerns, it’s Apple that was ranked the best, with just 3 percent users facing problems related to the snapper. Nokia and ASUS don’t fare well here, with over 15 percent ASUS users saying they faced issues related to the cameras on their phones. Talking about performance-related issues, it’s OnePlus that takes the crown yet again, with just about 6.5 percent users saying they faced slowdowns. Xiaomi sits somewhere in the middle of the pile with 15 percent of its users reported slowdowns. It’s Lenovo that sits at the bottom, with a whopping 40 percent of its users saying their phones displayed signs of slowing down. The data shows that waterproofing and quick charge support are the two most desired features, with 21 percent and 19 percent users expressing interest in them respectively. This isn’t surprising, given that the affordable smartphone segment is the most voluminous as far as sales numbers are concerned, and there are very options, if any, in that class that offer these features. In fact, there are no affordable waterproof phones at all, though there are some that are splash resistant. Front-facing flash and display notch are also much in demand, with the latter being an interesting insight. While some feel that display notches are unsightly and affect usage, many users seem to covet phones with display cut-outs so that they can stick to this new trend. Having a loyal set of users is a big deal for any brand, regardless of product category. The smartphone world is arguably the most dynamic, with companies launching new devices frequently, and the latest devices bring exciting new technologies and features that entice users. In such a scenario, a large base of loyal users would definitely be very advantageous to any smartphone manufacturer. With almost 60 percent of its current users saying they’ll stick to the same brand even when they upgrade their smartphones next, OnePlus seems to be in a very enviable position. Both Xiaomi and Apple also enjoy good brand loyalty, with over 50 percent of their users saying they’ll choose the same brands for their next smartphone. However, Huawei, Lenovo and Motorola don’t fare well here, with less than 20 percent of their users planning to use the same brand when the migrate to a new smartphone. Analysing the future buying trends brand wise, we can see that Samsung could lose about 18 percent of its users to Xiaomi and OnePlus. With 17 percent Xiaomi owners planning to move to POCO, it seems Xiaomi’s own sub-brand could cannibalise its sales, which may not be a bad thing at all. Looking at OnePlus’ own defectors, it seems that those who want to switch to other brands would possibly move to more premium devices from the likes of Apple and Samsung. It’s clear that while some brands fare better compared to others as far as satisfaction is concerned, there’s a lot more that smartphone manufacturers need to do to ensure their users stay loyal. The Indian smartphone arena will continue to be quite exciting in the time to come, and is bound to throw up lots of interesting trends and insights. Needless to say, we at 91mobiles will be on top of it, and will keep coming up with more of these insightful reports.